Eric Dinger received a Certificate of Recognition from the Lincoln Homeless Coalition on November 9, 2018 for his ongoing support and commitment to addressing homeless in the Lincoln community. Eric has been a member of the Matt Talbot Kitchen & Outreach board of directors since August 2012 and just was voted on for another 3 year term! He is the chair of the board’s Marketing, Public Relations & Outreach Committee and launched a task force on Ending Homelessness that included an ad hoc committee of Matt Talbot board members in partnership with other community members. Before joining the Matt Talbot Kitchen & Outreach board of directors in 2012, Eric started a volunteer hunger relief team that is still active today. As a member of the board, Eric helped to develop a speaker’s bureau and tour program to raise awareness about the array of services Matt Talbot provides and to help dispel myths about homelessness. Eric grasped onto the idea that ending homelessness is possible, and he began strategizing how we could turn this possibility into reality. Eric pulled together a task force of Matt Talbot board members and local leaders and began focusing his business savvy and entrepreneurial spirit on tackling this problem. Eric also rallied the Matt Talbot board to invest in new homeless prevention initiatives. The process of hiring a Housing Locator to serve as a liaison between homeless individuals and families, their case managers, and landlords who may be reluctant to consider a tenant with little to no rental or credit history and our housing first, First HOPE project came out of this enthusiasm as well. Thanks to Eric’s bold leadership and visionary commitment, Matt Talbot has been able to contribute to the reduction in homelessness over the last few years. And Eric’s commitment doesn’t stop there. 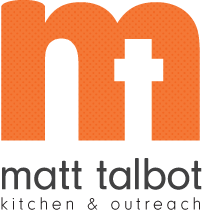 He and his wife Stephanie hosted a benefit Fish Fry for Matt Talbot raising over $20,000 and engaging more than 100 friends to contribute to our bold vision to defeat hunger and homelessness and restore hope. And while the task force stopped meeting the spark he ignited within Matt Talbot still burns bright. With his enthusiasm, energy, compassion and leadership, we believe anything is possible. Eric is a catalyst and an active community member. He is involved in many other organizations, always providing leadership and enthusiasm. He is a faith-filled servant, whose objective is to maximize his business and personal potential through passion, effort and integrity. He believes to those who much is given much is expected. He is one to give his all to a cause, and one of those causes is ending homelessness. Thank You and Congratulations Eric!